If you or someone close to you suffers from the chronic disease called asthma, you should be informed on the best asthma treatment. Since there is no cure for asthma, a patient must understand the treatments that will help them work with the doctor to manage the symptoms. When you have an asthma attack or are experiencing some symptoms, it is crucial to know when you should call your doctor or what you should do in order to prevent and asthma emergency. There are various treatments for asthma available nowadays. Have a look at the following list on how to treat asthma and get informed on what treatment suits you best. Asthma nebulizers are prescribed to people who have a difficulty using small inhalers. A nebulizer is a machine that consists of a mouthpiece of mask. It is most commonly used for small children, infants and older adults. When in the nebulizer, the asthma medications switch from liquid to mist so that the inhalation process is easier. It takes a bit more time than when using inhalers. When the person is suffering from exacerbation, the doctor can prescribe a course of oral corticosteroids. The side effects from these medications rarely occur in the recommended duration of 2 weeks, but if they need to be used for months, it is different. The side effects may occur and become quite serious, to the extent that they leave a permanent effect. Generally, the severe symptoms of the asthma attack are successfully controlled, so the prednisone doses are gradually minimized right after. Prednisone is a steroid medication taken orally. A brief course of these steroids may be prescribed in cases of worsening asthma symptoms or an attack. The prednisone is taken by mouth and absorbed in the body to later go straight to the lungs. This drug decreases the response of the immune symptoms when it comes to swelling symptoms and allergic reactions. Sometimes these systemic steroids are taken for a few days, but in high doses. This is also referred to as a steroid burst. Long-term asthma control can be recommended with a low daily dosage or a dose every other day. These are safe for a short burst usage, but there are serious side effects when it comes to long-basis use. They can be consumed in combination with supplemental calcium that is used to prevent the bones from thinning or osteoporosis. This is just one side effect of long-term steroid use for asthma treatment. This type of medications is the most important when it comes to asthma, since they are used to prevent the attacks. Some of these should be taken every day in order to keep the asthma under control, while other are taken when needed, with the purpose of reducing the attack severity. Bronchodilators can relieve the asthma symptoms. They work by relaxing the surrounding muscles around the airways. These muscles tighten in cases of asthma attack. 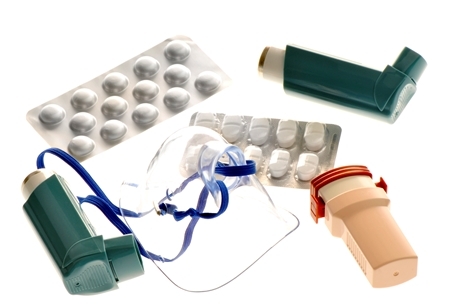 The bronchodilators are short-acting and often referred to as inhalers for rescue. These are used to relieve the cough, chest tightness, wheeze and breath shortness. Patients use them prior to exercise, if asthma symptoms occur as a result of exercise. These inhalers are not for daily used as a part of the progressive treatment of asthma. The purpose of them is to solely use them when needed, and if a patient needs them more than twice a week, they have not regulated the asthma well. Another type of bronchodilators are the long-lasting, sometimes used to control the asthma symptoms. These are never used alone, but in combination with a daily inhaled steroid. There are three types for treating asthma: beta-agonists, theophylline and anticholinergics. These are available in a tablet, inhaled, liquid and injectable form. Theophylline is a weak, but inexpensive bronchodilator. This treatment has a chemical that is similar to caffeine and works by relaxing the muscle surrounding the airways. It is also sold under the name Uniphryl and available as intravenous and oral drug. It is available in both short and long-acting form that is most commonly used to treat nighttime symptoms. These side effects can also occur as a result of taking grand quantities of medication. This is why it is important that you visit the doctor in order to determine the proper amount of medications according to your blood level results of the drug. There are certain medications that can interact with theophylline. These include seizure medicines, antibiotics and ulcer medicines. Therefore, it is crucial that the doctor is informed in case you are taking theophylline as a treatment for asthma. Smoking is generally bad when it comes to asthma patients, but the reaction is even increased when they are taking theophylline. Immunomodulators are injections given for moderate and severe asthma, when it is a result of allergy or other conditions. Reslizumab is a maintenance medication used in combination with the regular asthma medicines. It is given once every 4 weeks intravenously, for over a period of an hour. It is known to reduce the white blood cells that cause asthma symptoms and the severe asthma attacks. Omalizumab is an antibody known for its ability to block immunoglobulin E. It is used s a medication for asthma maintenance that prevents an allergen from causing an asthma attack. It is given as an injection. Mepolizumab can target the levels of blood eosinophils. Also referred to as rescue medications, these drugs are known to relax the muscles that surround the airway. People who have exercise-induced asthma should always use such drugs, usually a medication called a beta-agonist. Taking over-the-counter medications is a generally discouraged treatment. These medications are not long-term and should not be relied on for treating the asthma symptoms or attacks. They are especially not recommended to people who suffer from diabetes, heart disease, high blood pressure or thyroid disease. Allergy shots are yet another asthma treatment. Children who get allergy shots are known to be in the group that is less likely to get asthma. Allergies are known to be an asthma trigger, so it is always good to control them in order to reduce the occurrence of asthma attacks. There is no cure for asthma. Therefore, the duration of usage of medications depends on the individual case. This is based on two main factors: the severity of the condition and the frequency of the symptoms. Most people with asthma are recommended daily treatment. A spacer is a tube used to attach the inhaler and hold the medication. This makes the entire breathing in the device process much easier and helps the medication enter the lungs of the patient. All inhalers are not used with a spacer, so one must consult a doctor or a pharmacist if they need a spacer. Singulair, zafirlukast and Zyflo are all leukotriene modifiers that occur naturally in the human body. These inflammatory chemicals cause the airway tightening and the mucus production. There are leukotriene modifier drugs that help control the asthma by blocking these leukotrienes. They are usually taken in pill form and are known to decrease the need of the patient for other medications for asthma. These are also known to help people with nasal allergies and allergic rhinitis. Additionally, leukotriene modifiers can interfere with other medications such as theophylline and thinnerwarfarin. Therefore, one should always consult a doctor prior to taking any new asthma medications. Nucala or Mepolizumab is a biologic therapy used as a treatment of asthma. It works by controlling the blood cells that trigger this condition. They target the Interluken-5, which in term regulates the levels of blood eosinophils and lowers the asthma attack risk. Side effects of these immunomodulators include a hypersensitivity reaction and a headache. This can cause face and tongue swelling, hives, dizziness and breathing problems. Another immunomodulator called Omalizumbar has different effect than other asthma treatments. It is known to block the IgE activity before it leads the patient to experience an asthma attack. Immunomodulator treatment is known to reduce the asthma attacks number in people who suffer from moderate to severe allergic asthma. This asthma treatment is usually recommended for patients who suffer from severe asthma. The procedure includes usage of gentle heat that shrinks the smooth lung muscles. These muscles are known to tighten when asthma attacks occur and are the main reason why people find it hard to breathe. This procedure is performed at the hospital. It is given in three separate sessions with a distance of 3 weeks between them. Each of these treatments last an hour, in which a different part of the lung is treated. After the treatment is finished, the patient should rest for duration of 3 or 4 hours. If the lung test results are good, you may be released from the hospital. When it comes to treating asthma, there is nothing one can do to cure this disease. However, asthma is a chronic disease that can be controlled with properly adjusted treatment. In order to receive proper treatment, one has to consult a doctor. An asthma treatment is based on the severity of the chronic disease, the recurrence of the asthma attacks and the symptoms of the patient. This is not a disease to be taken unseriously, since it can cause some serious side effects and even life-threatening situations. There are certain treatments that should not be mixed with other medications and also, a change in lifestyle is needed in order for the asthma treatment to go well. If handled with care and proper treatment, people who have asthma can live a normal, long life.